Dian te Kei Kecil in the South East Maluku Regency is a small village with a couple of hundred inhabitants, which operates completely independently. The mission of the Foundation is to financially support projects of common good. The parents in this village face many costs of education for their children such as school uniforms and materials. 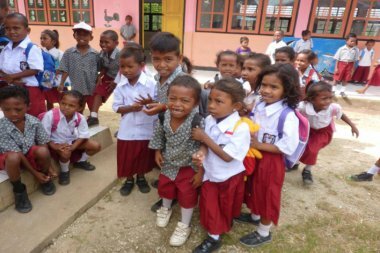 Without a school uniform the children cannot go to the local primary school. DuFor supports the foundation and this initiative financially, so the children will have school uniforms and can attend school. This initiative reduces school absenteeism and dropouts. into an electric pump with a solar system.